Pergola Farmhouses was founded in 1995 when we embarked on our very first renovation project. With the customer as our number one priority, we have strived to create one of a kind properties befitting our unique eco-island. With each year of investment and dedication to our family business, we have gained priceless experience in providing the best service to our guests whilst working in sync with our environment. Our promise to you is our full commitment to making your stay at Pergola Farmhouses a memorable one. 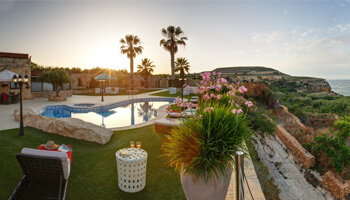 Set in an expanse of countryside, in a valley overlooking Ghajn Barrani Bay, the original 6 bedroom Pergola farmhouse goes beyond the essential. Featuring both an indoor and outdoor kitchen, a large pool with a jacuzzi, gardens and a private gym, will leave a permanent memory imprint. 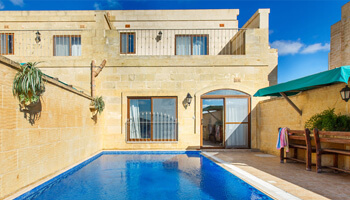 With original features characteristic of traditional Maltese infrastructure, this 6 bedroomed farmhouse is the perfect backdrop for the ideal Gozitan holiday. The enjoyment of handpicked grapes after a hearty BBQ is also a possibility during a stay at this unique property. Leave the world behind and set foot in this 4 bedroomed farmhouse, prepared for nothing but relaxation. Fully air conditioned, fully characteristic and fully memorable. Nestled in a villa complex, with indoor parking, private pool, country views and 4 ensuite bedrooms, Ta' Danjela is the perfect getaway without compromising the comforts of home. 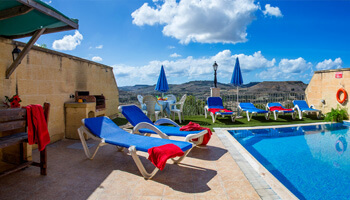 Neighbouring other rental villas, the two-storey fully-airconditioned Ta' Guljetta, comprises of four ensuite bedrooms as well as a private pool with country views. 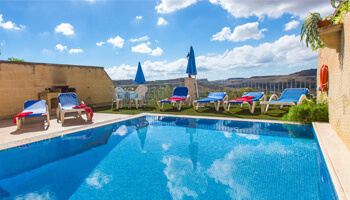 Embrace the Gozitan community, yet relish privacy, in this four bedroom maisonette with private pool and all amenities. Boasting of a spacious BBQ and sundeck area, Ta' Rozarja is the perfect place for that mouth-watering BBQ accompanied by fireworks so common in summer days. 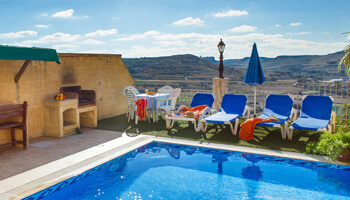 Let your mind explore the legends of the valley as dusk sets, a platter of Maltese bread soaked in the home made olive oil, fruit of the same surrounding land. Featuring 3 en suite bedrooms, a private pool and guaranteed comfort, this farmhouse is a home away from home. Nestled in a villa complex, with indoor parking, private pool, airconditioning, two ensuite bedrooms and country views, Ta’ Cikka is the perfect getaway without compromising the comforts of home. A two minute drive away from the nearest beach. Ta Dora offers all the comfort sought when the aim is true relaxation. This two-storey fully-airconditioned villa comprises three ensuite bedrooms, a private pool and country views. One of six situated in a villa complex, this fully-airconditioned three bedroomed villa, is close to both the vibrant village square as well as the lively fishing village of Marsalforn. 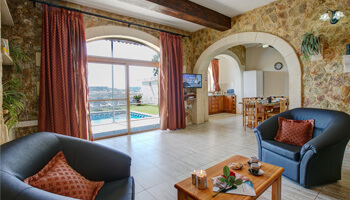 The villa features ensuite bedrooms, indoor parking, private pool as well as country views. Tastefully decorated, two-bedroom Ta Lucija ensures comfort without compromising quality. Full air-conditioning, stunning country views and a private pool make this property a perfect place to unwind in.